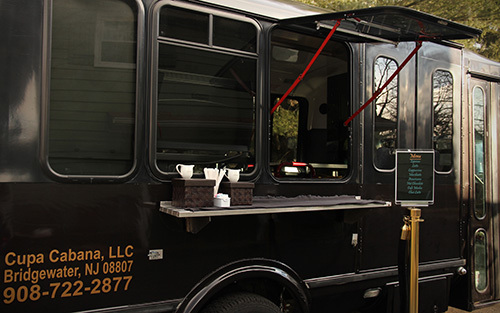 We are very happy to introduce the newly produced, state of the art, Cupa Cabana Espresso & Coffee Catering Truck. With the addition of the Espresso & Coffee Truck comes Cupa Cabana’s newest service, Curbside Coffee. The Curbside Coffee service allows us to set up a full service Espresso & Coffee Bar in nearly any outdoor location. Perfect for “goodbye coffee”, providing a to-go beverage for exiting guests, outdoor trade shows and exhibitions, and outdoor production sites. Cupa Cabana’s Espresso & Coffee Catering Truck is now available for hire for Curbside Coffee Service in the Tri State Area.